Imagine if you could attach tiny photovoltaic cells along the edge of your old drafting triangle (mine was pink) and generate electricity while while you were drafting. You can. Luminescent Solar Concentrator (LSC) technology isn't much different in theory and has been around 1970's but has faced major obstacles in terms of cost and long term durability of the plastics and dyes required. Recent advances in the automotive industry have led to plastics and dyes resistant to long term solar exposure while advances in the solar industry have lead to more affordable hardware. These breakthroughs coincide with emerging horticultural practices that explore the health and performance enhancing effects of color filters on plant photosynthesis. 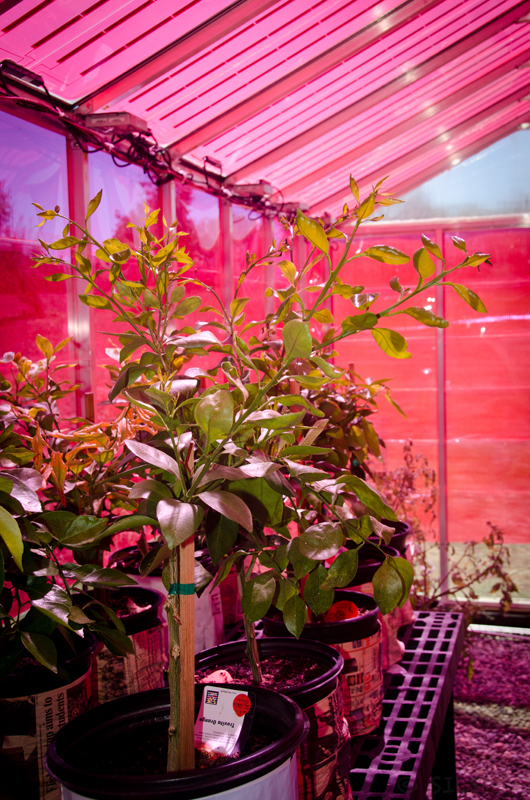 At the UC Santa Cruz Arboretum, university scientists and researchers are embarking on intersectoral 'cutting edge/growing edge' research into how LSC can be best adapted to new systems of greenhouse production. 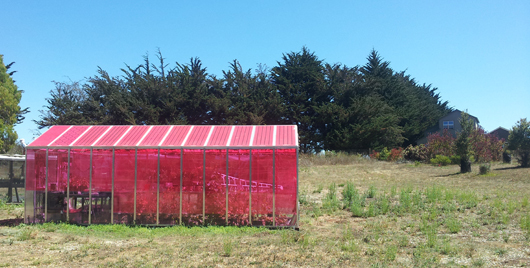 The research project just finished its first season comparing crop trial performance in two different greenhouses: one conventional and one retrofitted with an experimental LSC system that incorporates red light filters and produces 800w in full sun (50w per sqm) . Of the several different crop varieties, solanums (tomatoes, peppers, eggplants) in particular are know to benefit from red light. 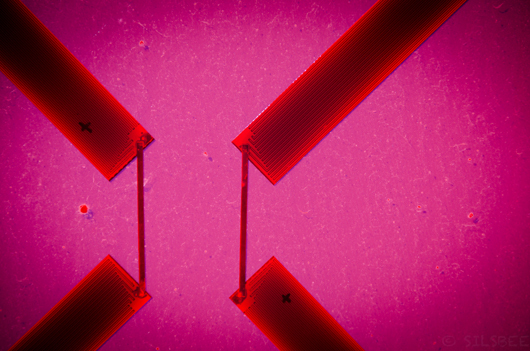 Meanwhile solar energy is collected from the rest of the color spectrum in the embedded concentrators via refraction within the red LSC sheets. Incidentally, solanums are also primary cash crops for many greenhouse and high tunnel productions in cold and marginal climates like Santa Cruz. Crop production data is yet to be released. -Can the solar greenhouses be used to help smaller or more environmentally conscious farms become more competitive in California food systems? -How can we develop a design process that takes into account the conscious and also unforeseen needs of small-scale Santa Cruz County farmers? -Who do we want to include in the design process and to what extent? They further hope to start a non-profit organization to facilitate the next phases of collaborative design and implementation of LSC greenhouses. Aside from the potential of providing small scale farmers with new affordable means of sustainability, grid parity and energy independence, there is also great interest in how LSC applications could enable large scale greenhouse producers to double as large scale renewable energy producers while enhancing their plant production within same footprint. While standard PV panels cost $1/watt and produce 200w/sqm, LSC panels can produce 50w/sqm at a $0.50/watt cost and alllow light transmittance below.